Technology continues to march ahead at an increasingly rapid rate. As a response to the demands placed on intellectual property (IP) systems by changing technologies, there have been changes in the scope and duration of IP protection. In August 2015, the Productivity Commission (PC) was requested by the Australian Government to undertake an “inquiry into Australia’s intellectual property arrangements, including their effect on investment, competition, trade, innovation and consumer welfare”. This inquiry was to take more of a holistic view of the IP system in searching for improvements. While there has been considerable coverage of the implications of the recommendations of the PC in relation to copyright law reform, there has been surprisingly little in respect of other areas of IP law. Given the dominance of patents in influencing innovation and social welfare, this is surprising. This article appraises the recommendations of the PC in the patent law area, particularly in light of the PC’s Terms of Reference. It also considers some matters the PC omitted to consider but which are nonetheless of paramount importance as innovation rapidly progresses. A “good” intellectual property (IP) system means different things to different stakeholders. Those in the IP rights-granting industry might say the system is “good” when it creates an incentive for innovation. Economists, however, focus on whether the incentive is set at the right level – recognising that IP rights that are too strong can impede subsequent innovation by others. It is clear, then, that getting right the balance between incentives to innovate and freedom to compete is the aim of IP policymakers. Pippa Hall, Chief Economist in the UK Intellectual Property Office, discusses the economist’s perspective on IP rights and innovation, reflects on her experience in implementing the recommendations of the Hargreaves Review and explains how using a robust evidence base contributes to better policymaking. The lessons to be drawn from these experiences are timely and valuable, given the reviews being undertaken of the Australian IP system. 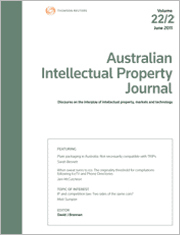 For the PDF version of the table of contents, click here: AIPJ Vol 28 No 1 Contents.